Mediterranean Diet Recipes by our Italian Grandmas! 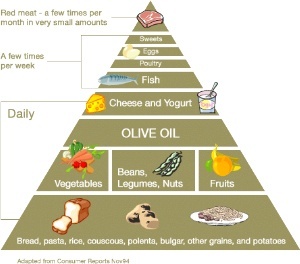 The Mediterranean Diet is a heart-healthy eating plan which combines many elements of the cuisines from countries bordering the Mediterranean Sea. Italy, being at the center of the Mediterranean Sea boasts a cuisine that is perhaps its leader as it makes heavy use of: Fruits, Vegetables, Grains, Olive Oil, Legumes, Herbs and Spices, Cheese, Fish and of course Wine! Plenty of reasearch have shown that the Mediterranean Diet reduces the risk of Cancer, Cardiovascular diseases and several other serious diseases including Parkinson and Alzheimer. Below, you will find our collection of Mediterranean Diet Recipes categorized by: Appetizers, First Courses, Entrees and of course... Desserts! Naturally, if you have a recipe that you would like to contribute and share with all the members of La Famiglia, please Register and add your recipes!